The spbscopes.SpectrumAnalyzerConfiguration object contains the scope configuration information for the Spectrum Analyzer block. MyScopeConfiguration = get_param(gcbh,'ScopeConfiguration') constructs a new Spectrum Analyzer Configuration object. You must first select the block in the model or give the full path to the block. Number of input ports on a scope block, specified by a character vector or string scalar. Maximum number of input ports is 96. "Inherited" — Spectrum Analyzer inherits the input sample rate from the model. "Property" — Specify the sample rate input directly using the SampleRate property. Open the Spectrum Settings. In the Main options section, in the Sample rate (Hz) combo box, enter a custom sample rate or select Inherited. Specify the sample rate of the input signals in hertz as a character vector or string scalar. To enable this property, set SampleRateSource to "Property". Open the Spectrum Settings. In the Main options section, enter a Sample rate (Hz) in the combo box. Specify (as a character vector or string scalar) the frequency span, in hertz, over which the Spectrum Analyzer computes and plots the spectrum. The overall span, defined by this property and the CenterFrequency property, must fall within the Nyquist frequency interval. Open the Spectrum Settings. In the Main options section, clear Full frequency span and set Span. Specify (as a character vector or string scalar) the frequency center, in hertz, over which the Spectrum Analyzer computes and plots the spectrum. The overall frequency span, defined by the Span and this property, must fall within the Nyquist frequency interval. Open the Spectrum Settings. In the Main options section, clear Full frequency span and set CF (Hz). Start of the frequency interval over which spectrum is computed, specified in hertz as a character vector or string scalar of a real scalar. The overall span, which is defined by this property and StopFrequency, must fall within the Nyquist frequency interval. End of the frequency interval over which spectrum is computed, specified in hertz as a character vector or string scalar of a real scalar. The overall span, which is defined by this property and the StartFrequency property, must fall within the Nyquist frequency interval. "Auto" (default) | "Property" | "InputPort"
Specify the source of the resolution bandwidth (RBW) as "Auto", "Property", or "InputPort". "InputPort" — An input port is added to the Spectrum Analyzer block to read the RBW. This option is only applicable to frequency input. Time domain input — Open the Spectrum Settings. In the Main options section, set RBW (Hz). Frequency domain input — Open the Spectrum Settings. 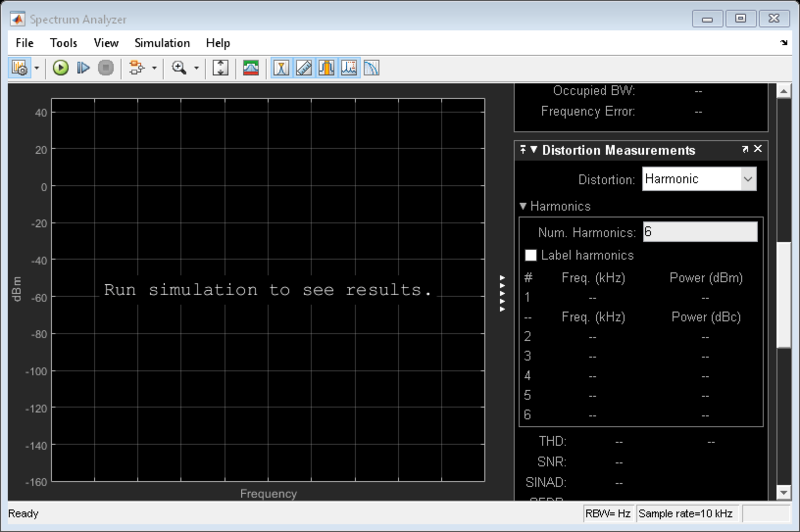 In the Frequency input options section, set RBW (Hz). Control the frequency resolution by specifying the window length in samples used to compute the spectral estimates. The window length must be an integer scalar greater than 2, specified as a character vector or string scalar. FrequencyResolutionMethod to "WindowLength", which controls the frequency resolution based on your window length setting. FFTLength value is greater than or equal to the WindowLength. Specify the number of filter taps or coefficients for each frequency band as a character vector or a string scalar. This number must be a positive even integer. This value corresponds to the number of filter coefficients per polyphase branch. The total number of filter coefficients is equal to NumTapsPerBand + FFTLength. To enable this property, set Method to "Filter Bank". "InputPort" — An input port appears on the block to read the frequency vector input. The percentage overlap between the previous and current buffered data segments, specified as a character vector or string scalar of a real scalar. The overlap creates a window segment that is used to compute a spectral estimate. The value must be greater than or equal to zero and less than 100. Specify a character vector or string scalar of a real positive scalar for the dBFS full scale. Specify the number of spectral averages as a character vector or string scalar. The Spectrum Analyzer computes the current power spectrum estimate by computing a running average of the last N power spectrum estimates. This property defines N.
To enable this property, set AveragingMethod to "Running". Specify the exponential weighting as a scalar value greater than 0 and less than or equal to 1, specified as a string scalar or character vector. To enable this property, set AveragingMethod to "Exponential". Specify the load the scope uses as a reference to compute power levels. Numeric scalar (specified as a character vector or string scalar) — Apply the same frequency offset to all channels, specified in hertz as a character vector. Numeric vector (specified as a character vector or string scalar) — Apply a specific frequency offset for each channel, specify a vector of frequencies. The vector length must be equal to number of input channels. Set this property to true to treat M-by-1 and unoriented sample-based inputs as a column vector, or one channel. Set this property to false to treat M-by-1 and unoriented sample-based inputs as a 1-by-M row vector. Specify the channel for which the spectrogram is plotted, as a character vector or string scalar of a real, positive scalar integer in the range [1 N], where N is the number of input channels. Specify the time resolution of each spectrogram line as a character vector or string scalar of a positive scalar, expressed in seconds. Channel over which the measurements are obtained, specified as a character vector or a string scalar which evaluates to a positive integer greater than 0 and less than or equal to 100. The maximum number you can specify is the number of channels (columns) in the input signal. Select Simulation > Reduce plot rate to improve performance. To enable this property, set AxesScaling to "Updates". Open the Axes Scaling dialog box and set Number of updates. Set this property to true to open the scope when the simulation starts. Set this property to false to prevent the scope from opening at the start of simulation. Select File > Open at Start of Simulation. Set this property to true to show the spectrum analyzer window, or false to hide the spectrum analyzer window. 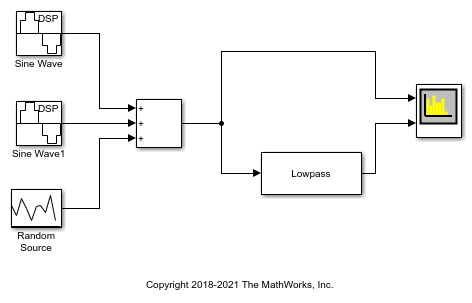 Create a new Simulink® model with a randomly-generated name. Add a new Spectrum Analyzer block to the model. Call the get_param function to retrieve the default Spectrum Analyzer block configuration properties. Filter a streaming noisy sinusoidal input signal using a Lowpass Filter block. The input signal consists of two sinusoidal tones: 1 kHz and 15 kHz. The noise is white Gaussian noise with zero mean and a variance of 0.05. The sampling frequency is 44.1 kHz. Open the model and inspect the various block settings. Access the configuration properties of the Spectrum Analyzer block using the get_param function. Run the model. The Spectrum Analyzer block compares the original spectrum with the filtered spectrum. The right side of the spectrum analyzer shows the enabled measurement panes. Use the getMeasurementsData function to obtain these measurements programmatically. The values shown in measurement panes match the values shown in data. You can access the individual fields of data to obtain the various measurements programmatically. As an example, compare the peak values. 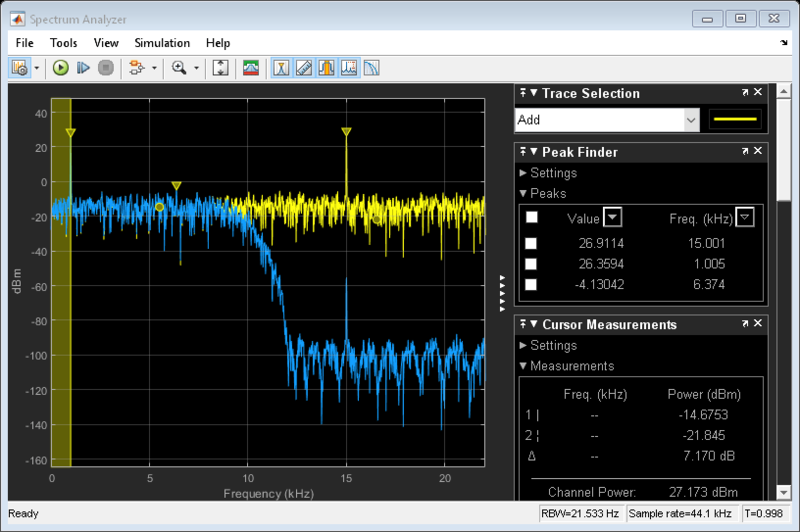 Verify that the peak values obtained by data.PeakFinder match with the values seen in the Spectrum Analyzer window.